Bulle electric clocks were developed in France just prior to the Great War of 1914-1918. It was at time in the early 20th Century that there was a great deal of activity throughout Europe, the UK and USA in developing domestic clocks which would operate on battery power. Two Frenchmen, working initially independently, on aspects of electric solenoids and clockwork mechanisms ultimately came together to create the Bulle clock. Professor Marcel Andre-Moulin gained a Science degree in 1904 and his Doctorate in Science in 1910. He became a lecturer in Chronometry at the Faculty of Science Bensancon and then was named Director of that Institute. By 1912 Andre-Moulin had developed the system of using a solenoid with a 3 pole tungsten magnet which, in 1914 he used to construct an electric clock. Maurice Favre-Bulle was born in Bensancon, into a family of clockmakers. He studied at l’Ecole d’Horolgerie de Bensancon from 1885 – 1888 before joining his brother in taking over and running the family clock factory Favre-Heinrich. During the Great War Favre-Bulle worked at the engineering laboratories of the Faculty of Sciences of Paris, developing military timers, watches, timing systems and telegraphy. At the end of the war Favre-Bulle joined with Marius Lavet to form La Societe Bulle et Cie, a company to develop prototype electric clocks. In 1920 a patent was taken out by Favre-Bulle for an electric clock. The patentees were Favre Bulle and Madame Veuve Andre-Moulin, the widow of Marcel Andre-Moulin. The commercial exploitation of this patent followed. In 1920 Compagnee Generale des Appareils Horo-Electrique was established to commence the commercial production of the Bulle clock. During the period 1920 to 1952 production is estimated to have been some 300,000 clocks. All used the contact system as outlined in the original patent and over 100 different case designs were utilised. As the years progressed the movement remained basically unchanged although new materials were introduced as they became commercially available, e.g. aluminium, Bakelite, chrome. Production was also started in England in 1934 and these clocks exhibited obvious differences to the French product, particularly in the direction of reducing the cost. This included lighter gauge metal, steel plate rather than brass, smaller half-arc magnets, etc. 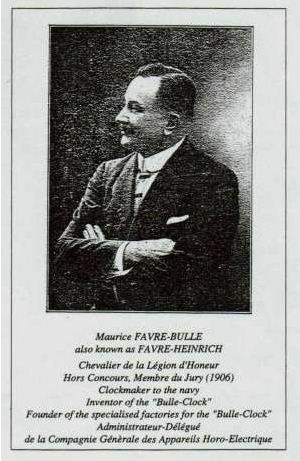 Favre-Bulle died in April 1954, aged 84. Production ceased as he had no descendants and transistor control of electric clocks was immanent thus making the Bulle technology redundant. The clock is based on the reaction between a permanent bar magnet and an electric coil, hence it is classified as an electromagnetic clock. In the Bulle clock the coil forms part of the swinging pendulum. When the pendulum is in motion, it makes and breaks electrical contact at the pin and the fork. Current flows for the split second of contact, activates the coil and produces a magnetic field around the coil. This magnetic field opposes the field in the bar magnet, which pushes (impulses) the coil, hence pendulum swings away from the central magnetic pole. The Bulle magnet is unique and hard to believe it can exist. Made of cobalt steel, in either an arc or U-shape, it has three poles ! This unique feature produces a very high magnetic field at the centre of the bar and at this point the lines of force are perpendicular to the axis of the magnet. When the coil is activated at the centre point of its swing, ie. the centre of the bar magnet, the coil’s field cuts the magnetic field to create the opposing reaction and drive the pendulum away. Please note that the diagram to the left is actually incorrect. The lines of force from the coil do not radiate outwards as shown (“Claimed”). The lines of force align themselves along the coil, and work at right angles to the magnet’s field (“Actual”). This is shown in the additional sketch. It is also worth noting that the unique magnet design is also its downfall. The design is such that eventual demagnetisation is a certainty, because the magnetic domains at the centre of the magnet are in constant opposition. While it is not immediately apparent, the Bulle clock is polarity sensitive. If the battery is connected the wrong way around, the clock will not run. This is determined by the direction in which the coil is wound, and the magnet. The very first test of a newly acquired Bulle will reveal if the battery is connected properly. If the clock won’t run, try reversing the battery polarity first. Further work is needed only if this fails to make the clock work. The silver pin and the fork contact must be absolutely clean. Even a small amount of tarnish will stop the clock, because of the low voltage and minimal contact pressure.The silver pin and the fork contact must be absolutely clean. Even a small amount of tarnish will stop the clock, because of the low voltage and minimal contact pressure. Here you can see the sequence of events as the pendulum swings. The pin makes contact only with the uppermost corner of the fork contact, and the contact period is very short. I have measured it at ~190ms, although the actual time will vary somewhat depending on the way the clock has been set up. A small variation is to be expected, and it will also vary depending on the pendulum period (714ms for the one I measured, representing an 84 beat/minute pendulum). It is probable that if the contact duration is around 25% of the pendulum period the contacts are reasonably well adjustmed. Make sure that the silver contact spring, its rolling loop and the loop pin are also scrupulously clean. These points must never be oiled because the oil film can create an insulating barrier which will prevent current flow. To compensate for variation in battery voltage, the Bulle clock is fitted with an isochronism corrector which, by its arrangement, causes a retarding force on the pendulum with each oscillation. This is zero to start with but increases with the amplitude and, adding to the force of gravity, enables the clock to maintain a constant rate in spite of amplitude variation. Note the gap in the end cheek of the coil former. These are made from brass, and would create a short-circuited turn if the gap were missing. This would introduce more than enough loss to stop the clock. Bulle clocks were designed to run on 1.5 volts DC and, with the extremely low current draw, a modern alkaline D cell will last for over a year. If the clock will not operate on 1.5 volts then there is a problem in the circuit. The circuit is extremely simple with a battery, a switch and a coil all in series. The coil has a nominal resistance of 1100 – 1200 ohms derived from a winding of 0.071 mm enamelled copper wire. When operating normally the peak current drawn is typically 1.3 milliamps. The average current is a great deal lower, because the coil is only switched into the circuit very briefly. With a contact duration of 25% (typical), average current is 1/4 of the peak, or about 325uA (325 microamps, or 0.325 milliamp). When restoring a Bulle the mechanism is extremely simple but composed of many very small parts. The sequence of dismantling must be identically reversed for reassembly to ensure the clearances and components will operate correctly. The electric circuit may be simple but there are electrical connections throughout the circuit, ie. at the battery terminals, at the flexible connection, at the coil in and out terminals, at the two chassis connections, and the silver loop spring, all of which must be clean and sound to ensure a zero resistance connection. A good test for the circuit, assuming there is continuity, is to apply a 1.5 volt DC supply. If it will not run then there is either a high resistance connection in the circuit OR the magnet has lost its original level of magnetism. Check every connection for security and cleanliness. Still won’t run on 1.5 volts?? Apply 9 volts. If it now runs the circuit is OK however the magnet strength is to be questioned. The sliding silver pin and fork must be spotlessly clean with no trace of oil contamination. These contact surfaces can be burnished. Because there is a very small current flowing there is very little sparking at the contacts to cause pitting or erosion. Similarly the rolling silver spring loop and its contact stud must be spotlessly clean. The mechanical components of the movement may be oiled but extreme care must be taken to keep all traces of oil away from electrical connections. When all Else Fails … Remagnetise ! As mentioned before a magnet can and does loose its strength over time due to natural reorientation of the magnetic “domains” in the steel. Demagnetisation may also be due to heat or impact. The Bulle magnet is especially susceptible because of the two opposing North poles at the centre of the magnet. This places the domains in permanent maximum opposition, and with the relatively poor magnetic materials available at the time these clocks were made, de-magnetisation is a matter of “when”, not “if”. A permanent magnet may be revitalised by simply exposing it to a very strong magnetic field. But how does one create the weird Bulle 3-pole magnet? Simply by winding a heavy cloth insulated 1mm copper wire around the magnet as shown below, and applying a brief high current from a supply of about 12 volts DC. The wire must be wound around the magnet exactly as shown, with the wire wound in the direction indicated. Wind a single tight layer of 1mm wire, with no spaces between adjacent turns. Make certain that the winding wire does not make electrical contact with the magnet. Note that this method has been used many times, but strictly speaking is not really recommended. Should the lead manage to weld itself to the battery terminal, a massive current will flow – the leads, coil and magnet will become extremely hot. There is a risk of burns, and possible damage to the battery. While a “proper” magnetising circuit can be used, these are beyond the scope of this article, and are very expensive – even to build.